Cameron International Corporation (formerly Cooper Cameron Corporation, CCC) is a Schlumberger company and a global provider of pressure control, processing, flow control and compression systems as well as project management and aftermarket services for the oil and gas and process industries. It employs approximately 23,000 people and is headquartered in Park Towers South, Houston, Texas. In 2006 Cooper Cameron was officially renamed "Cameron." Drilling & Production Systems manufactures pressure control equipment and provides aftermarket services for worldwide onshore, offshore and subsea oil & gas drilling and production operations. Also provides system design and project management services for worldwide offshore oil and gas completion operations. Through their acquisition of LeTourneau Technologies drilling, power systems, and offshore divisions, they also manufacture drilling equipment including top drives, drawworks, rotary tables, and mud pumps, as well as designs and components for jackup rigs. Surface Systems manufactures and designs Wellheads, Fracturing Trees and other wellhead products for onshore and offshore oil production. Over the years Cameron acquired Ingram Cactus, Tundra and McEvoy companies which has grown Cameron's aftermarket knowledge and market share in the wellhead industry. Valves & Measurement manufactures flow control equipment and provides aftermarket services for worldwide onshore, offshore and subsea oil & gas production, pipeline and process operations. Measurement Systems designs, manufactures and distributes measurement, quality, and control instrumentation for the global oil & gas and process control industries. Petreco Process Systems provides processing equipment and aftermarket services for worldwide onshore and offshore oil & gas production and refining operations. Compression Systems manufactures compression equipment and provides aftermarket services for worldwide onshore and offshore gas production and transmission and for global process operations. Cooper Industries began in 1833 when Charles and Elias Cooper established a foundry in Mt. Vernon, Ohio. Cooper was licensed to produce the Corliss steam engine in 1869 and entered the production of natural gas internal combustion engines in 1900. In 1929, Cooper became the Cooper-Bessemer Corporation when it merged with Bessemer Gas Engine Company, which was founded in Grove City, Pennsylvania in 1899. In 1958, Cooper diversified into the controls industry with the establishment of the En-Tronic Controls Group. Five years later, the company acquired the Ajax Engines Company, founded in 1877, and the Pennsylvania Process, founded to manufacture compressors in 1920. In 1965, the growing Cooper Industries branched out into electrical, automotive and tools and hardware industries. Two years later, it moved its headquarters to Houston and in 1968 began the Cooper Rolls joint venture with Rolls-Royce to market gas turbines. 1987 marked the acquisition of Joy Industrial Compressor Group, founded in 1955 in Buffalo, New York, which was renamed Cooper Turbocompressor as part of Cooper Compression. W-K-M valves company, established in 1905 in Houston, and Demco Valve Company, established in 1947, were both acquired by Cooper Flow Control Division in the same year. One year later, Cooper acquired Enterprise Engine aftermarket services business. 1989 marked the acquisition of Cameron Iron Works, which was renamed Cooper Oil Tool. Cameron Iron Works was incorporated in Houston in 1920, by Harry Cameron and James Abercombie, and had branched out to Canada in Edmonton in 1951. It purchased the British Oil Field Equipment Company of London and Leeds in 1954 and acquired McEvoy valve and wellhead manufacturer, founded in 1905, and Willis oilfield choke manufacturer, formed in 1939, in 1987. In 1994, Cooper Industries spun off its Petroleum and Industrial Equipment Group to focus on the electrical products, automotive products and tools & hardware businesses. One year later, Cooper Cameron Corporation was spun off as a publicly traded company with a separate management group and Cameron and Cooper Cameron Valves divisions were formed from Cooper Oil Tool. Wheeling Machine Products Company's oilfield coupling business was also sold. The growing company acquired many different companies into various divisions from 1996 to 1998. Ingram Cactus Corporation, Tundra Valve & Wellhead Corporation, Wellhead Services and Marta Company were combined into Cameron. Ajax Repair & Supply, General Turbine Systems, PDQ Machine, and certain assets of Enox Technologies were acquired and combined into Cooper Energy Services. 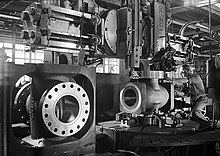 Daniel Ball Valve and Orbit Valve International were acquired into Cooper Cameron Valves. In 1999, the rotating compressor business was sold to Rolls-Royce and Cooper Energy Services merged with Nickles Industrial Manufacturing and purchased Elliot Turbocharger Group, Inc. Three years later, Cooper Cameron Valves acquired Nutron Industries and in 2003, Cooper Energy Services and Cooper Turbocompressor combined to form Cooper Compression. In the 21st century, Petreco International was acquired and began operation as a separate division and PCC Flow Technologies, NuFlo Technologies and Dresser Flow Control were acquired and combined into Cooper Cameron Valves and Cameron. In 2006, Cooper Cameron Corporation officially changed its name to Cameron International Corporation. In 2011, Cameron purchased the Drilling, Offshore, and Power Systems divisions of LeTourneau Technologies. On January 20, 2014, Cameron announced that its reciprocating compression division, (Cooper-Bessemer Corp's last direct descendant) would be purchased by GE Oil and Gas, and would be in the Downstream Technologies Solutions business unit. In August 2014, it was announced that Ingersoll-Rand would acquire Cameron International’s centrifugal compression unit for $850 million. In April 2016, oilfield services company Schlumberger completed the acquisition of Cameron International for $14.8 billion, in a combination of stock and cash. Cameron manufactured and sold to Transocean in 2001 the blowout preventer (BOP) that failed to close the well head and stop the flow of oil from the Deepwater Horizon oil well in the Gulf of Mexico. News reports stated the equipment was not properly maintained by its operators and may have led to failure of the BOP system. In December, 2011, Cameron agreed to pay a $250 million settlement to BP PLC to settle all claims related to the Deepwater Horizon without admitting responsibility. ^ "Cameron Locator Archived 2010-04-27 at the Wayback Machine." Cameron International Corporation. Retrieved on April 28, 2010. ^ "Cooper Cameron Shareholders Approve Change of Company's Name to Cameron" (Press release). Cameron International Corporation. 2006-05-05. Retrieved 2006-05-10. ^ Keller, David N. (1983). Cooper Industries 1833-1983. Ohio University Press. ISBN 0-8214-0751-1. ^ "Cooper Cameron Acquires Dresser Flow Control Businesses" (Press release). Cameron. 2005-12-01. Retrieved 2006-05-10. ^ "Cooper Cameron Shareholders Approve Change of Company's Name to Cameron" (Press release). Cameron. 2006-05-05. Retrieved 2006-06-18. ^ "Drilling". Archived from the original on 2016-05-22. Retrieved 28 August 2015. ^ "OneSubsea Announcement". Archived from the original on 2014-04-02. Retrieved 28 August 2015. ^ "Cameron and Schlumberger Complete New Subsea Company". Archived from the original on 2014-04-02. Retrieved 28 August 2015. ^ "Ingersoll-Rand to buy Cameron International unit for $850 million" (Press release). Reuters. 19 August 2014. ^ "Schlumberger to Buy Cameron in $14.8 Billion Oil Services Deal". Bloomberg. 26 August 2015. Retrieved 27 August 2015. ^ Hargreaves, Steve. "Gulf of Mexico oil spill could cost BP $3 billion or more". Money.cnn.com. Retrieved 2012-01-26. ^ Gelsi, Steve, "Cameron rises on BP settlement ...", MarketWatch, December 16, 2011 4:29 pm EST. Retrieved 2011-12-16. This page was last edited on 4 April 2019, at 06:09 (UTC).